Dr. Pandey is an internal medicine physician and a health services researcher with the Center for Health and the Social Sciences at the University of Chicago. He studies health services, their design and organisation within the healthcare delivery systems. Within this, Dr. Pandey is especially interested in distributed and community level health systems. Dr. Pandey has studied the design of health services and systems globally, with a special focus on South Asia and North America. Dr. Pandey has designed and evaluated service delivery models for non-communicable diseases, tuberculosis, and HIV/AIDS. He has also studied the financial burden of health services expansion. Dr. Pandey has also written on health services and systems to meet the goals of universal health coverage. He is also the founder and chief of research at Shastra Healthsciences, a health services transnational research company that designs and deploys health services in South Asia. 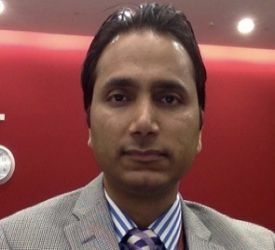 Dr. Pandey obtained his undergraduate medical degree from Kathmandu University in Nepal, followed by post-graduate residency training in internal medicine at the Rosalind Franklin University of Medicine and Science in Chicago. Subsequently Dr. Pandey moved to the University of Chicago where he pursued fellowship training in Advanced Training in Hospital Medicine as well as another fellowship in Health Services Research. He also obtained a master's degree in public health sciences at the Department of Public Health Sciences at the University of Chicago.